On this past Wednesday workday we planted a small curry leaf plant along with a hops, rhubarb, and a kids bean teepee. Things at the garden are starting to take shape for this planting season. We'll post something soon about our planting design for this year's summer garden. 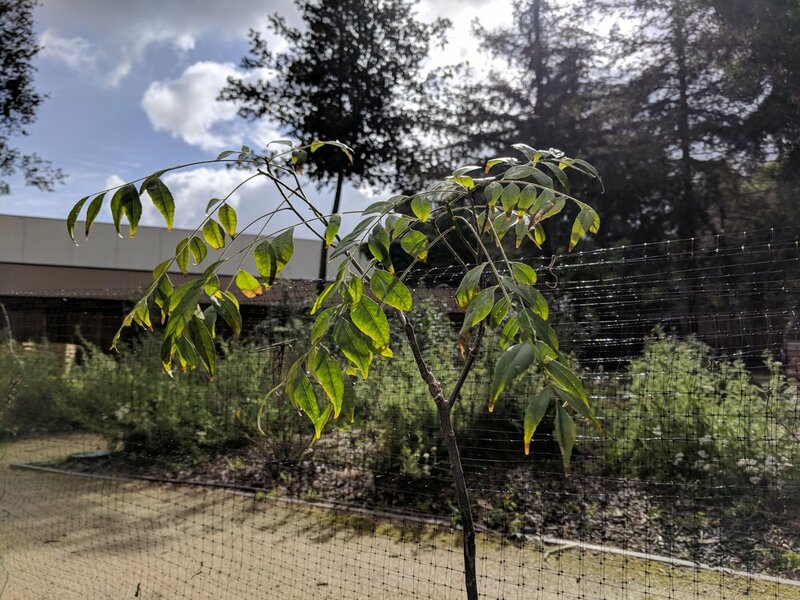 Gardener Minati shared the following story about the curry leaf plant she donated to the garden. I have had this plant for over about 2 years in my patio, in a pot and would love to share some history about it! I was always interested in adding a few Indian plants to my patio and was looking for some leads to buy these. I stumbled upon 'The Curry Leaf Man' on craigslist! The Curry Leaf Man is a San Francisco native married to an Indian woman. He was introduced to curry leaf by his wife's family. He decided to cultivate a few Indian starter plants like Curry leaf, jasmine, drumsticks etc from seeds / cuttings and donate all the money from plant sale to charity for kids education in villages in India. This was a win/win for me! I get to buy some cool plants and also get to donate! Apart from curry leaf, I also bought a couple other plants like lemongrass and jasmine. I was pretty thrilled to find someone growing starter plants so close to home in Palo Alto! And I am happy that this plant now has a home at Soil & Water.